Rumors about a new species of a large-flowered Cattleya that lurked in the dense jungles around the Gran Sabana in the southeastern corner of Venezuela were beginning to find their way into orchid circles in Venezuela in the mid-1960s. How a new species could appear at this late date was beyond understanding. After all, Venezuela had been the hunting ground for Cattleya collectors for more than 120 years, beginning with the discovery of Cattleya mossiae in 1836. Virtually no area of Venezuela had been left untouched. Most orchidists dismissed the idea as “ridiculous”. Then, in 1968 and 1969, a few plants were brought from the jungle that were not quite like the Cattleya species that were familiar to everyone. They looked like a poor variety of Cattleya labiata , but the flowers had a sweet scent reminiscent of Cattleya gaskelliana. A couple of plants found their way to the famous Venezuelan orchidist G.C.K. Dunsterville, who wrote an article about them in the British publication The Orchid Review (October 1969). The article was titled “Orchid Puzzlements” and it created an aura of intrigue and excitement around a shadowy purple image from the Venezuela interior. Dunsterville had no name for the new Cattleya and referred to it only as “Cattleya guayana” (Guayana being the broad area of Venezuela where the plants were believed to exist). In December, 1971, after two years’ investigation, Dunsterville wrote a more comprehensive article for the United States publication The Orchid Digest, which featured a color photograph and botanical drawings of the new Cattleya. Dunsterville had also asked Leslie Garay at The Orchid Herbarium of Oakes Ames at Harvard if the species had ever been described before. Garay made the remarkable discovery that the species had indeed been found back in 1906 and described at that time by John Rolfe, editor of The Orchid Review. It was named Cattleya jenmanii and it even sported a proper botanical description in Latin, a rare thing for a large-flowered Cattleya species. Rolfe had desribed the species in Kew Bulletin 20 and The Orchid Review of July 1906. He named the species in honor of “the late Mr. G.S. Jenman, the Government Botanist in Georgetown, British Guiana,” who had sent plants to a Miss Sinnock of Downford, Hailsham, Sussex, England. It was Sinnock’s plants and flowers Rolfe used for his description. Unfortunately, Rolfe must not have thought too much of the new species because he did not bother to mention it in 1907 as one of the important plant events in 1906, and nothing much was heard of C. jenmanii after that. 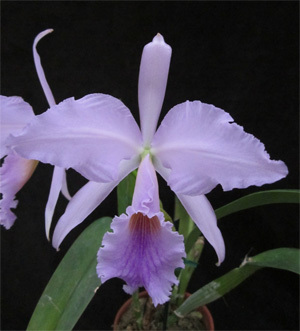 The first published pictures of C. jenmanii would not inspire many Cattleya lovers to try to acquire a plant. Like the earliest C. labiata, they were inferior clones that were poorly grown. They had virtually nothing to recommend them to the horticulturist over any of the established large-flowered Cattleya species. Eventually, however, good clones were found that were quite beautiful and distinctive and these have helped define the character of the species as we know it today. Cattleya jenmanii is basically a dwarf-pseudobulb member of the large-flowered group of cattleyas, and this compact habit, along with its strong, wonderful fragrance and free-flowering nature, are the most distinguishing features of the species. Cattleya jenmanii has the same general color patterns in its lavender flowers as C. labiata, and some clones can easily be mistaken for C. labiata. There are also clones that look similar to C. gaskelliana. Cattleya jenmanii, however, is easily distinguishable from C.labiata by its single sheath, because C. labiata normally has a double sheath. Cattleya jenmanii also usually has smaller flowers than C. labiata and it flowers at the end of the C. labiata season. While C. jenmanii has a wonderful fragrance, similar to C. gaskelliana, it can be separated from C. Gaskelliana by its flowering habit. Under conditions in the United States, C. gaskelliana flowers as the pseudobulb is still maturing, while C. jenmanii completes its new growth and, like C. labiata, rests for a few months before sending up flowers. Cattleya gaskelliana also flowers in June in the United States, while C. jenmanii normally blooms in the autumn. Some authors have dismissed the single-sheath versus double-sheath difference between C. jenmanii and C. labiata because C. labiata will occasionally produce a single sheath (or no sheath at all), and C. jenmanii, on rare occasion, has been known to produce a double sheath. The idea that a double sheath is not a basic characteristic of C. labiata, however, is absurd, and has tended to confuse a clear difference between C. jenmanii and C. labiata. More than 99 percent of all C. labiata have double sheaths and the few that have a single sheath or no sheath are natural anomalies. A single-sheathed C. labiata is no different from a C. labiata with two lips; these phenomena do occur due to culture or mutation, but they are certainly not basic characteristics of the species. There is no doubt today that C. jenmanii is a separate and distinct species of Venezuelan Cattleya, giving Venezuela six proud unifoliate Cattleya species- C.mossiae, C. gaskelliana, C. leuddemanniana, C. lawrenceana, C. percivaliana, and C. jenmanii. In its native Venezuela, C. jenmanii grows between 1,300 and 3,600 feet above sea level in relatively dense forests. The temperature in these areas varies from about 60 to 85 F. Cattleya jenmanii grows both as an epiphyte on tree branches and as a lithophyte on rock outcroppings. There are considered to be two biotypes that come from somewhat separated areas. One type has light- to medium-lavender flowers with relatively good shape and large size. The other type produces smaller, more poorly shaped flowers, but with much richer color. In nature, C. jenmanii is reported to flower twice a year, once from February to April and again from September through October. In cultivation in the United States, however, it is normally only an autumn bloomer. Cattleya jenmanii has all the normal color forms of the large-flowered Cattleya species. A beautiful alba clone, ‘Fuchs Snow’, received a rare First Class Certificate from the American Orchid Society. There are also some very attractive semialba clones like the one pictured in this article. There are good lavender clones and even attractive coeruleas. Two years ago, one of my Venezuelan readers sent me a plant of a coerulea clone he thought I would enjoy- and I certainly have. It is very floriferous, has a magnificent fragrance that fills the whole house, and is one of the best coeruleas I have seen in a Cattleya species. This plant alone made C. jenmanii one of my favorite orchids. One of C. jenmanii’s endearing qualities is its free-flowering nature. It normally produces three to five flowers on a flower stem, and even on a weak or poorly established plant, it will often struggle and produce three flowers regardless of the damaging effect on the plant. Cattleya jenmanii is known to produce as many as seven flowers on a flower spike. Because it was not discovered until 1908, C. jenmanii is not mentioned or pictured in any of the famous old orchid books like Reichenbachia, Lindenia or Williams’ The Orchid-Grower’s Manual. It was mentioned in the 1927 edition of Sander’s Orchid Guide as a “rare and handsome species of the labiata section…”. Sander’s is the only company that made an effort to use C. jenmanii in hybridizing. In 1954, Sander’s flowered a hybrid between C. jenmanii and C. percivaliana, which is the first cross ever registered for this species. 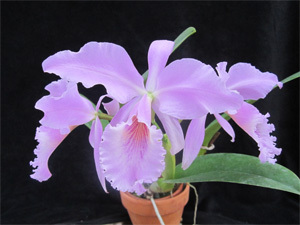 Sander’s thought so much of the cross that it was named Cattleya David Sander. Since then, there have been no other C. jenmanii crosses registered despite the 30-plus years that have passed since its rediscovery in 1969. Before the discovery of C. jenmanii, the Gran Sabana of Venezuela was known as the home of C. lawrenceana. So it was no surprise that a natural hybrid between C. jenmanii and C. lawreneana. Cattleya xgransabanensis, was found. It seems strange that it took more than six decades to rediscover C. jenmanii after it was described in 1906. It is as though King Arthur’s famous magician, Merlin, had waved his magic wand over the species and cast a spell upon it that put it to sleep for the next 60 years. In its majic sleep, C. jenmanii missed the “golden age of the Cattleya species” with its plundering Victorian plant collectors, and it escaped the attention of the cut-flower merchants who ravaged the jungles during the 1930s and 1940s to fill huge commercial greenhouses, only to see the plants discarded by the tens of thousands in the 1060s When the spell was broken, C. jenmanii awakened to an age of environmental and species conservation- lucky orchid. But, even C. jenmanii is not immune to the native poachers, who sell the plants to tourists who cannot take them out of the country legally, so Venezuelan growers have had to rescue plants and produce sib crosses to guarantee the species’ survival. Let us hope that, like Merlin, C. jenmanii will grow younger instead of aging as the years go by, and it will blossom everywhere orchids are grown into one of the jewels of the large-flowered Cattleya species. 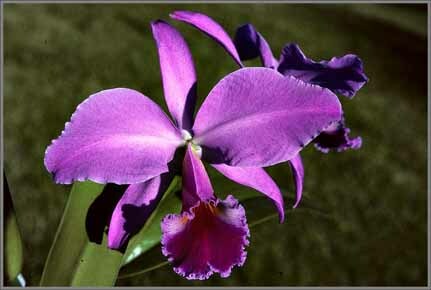 It is certainly a worthy member of the new age of the Cattleya species. Cattleya jenmanii has almost no history as a parent in hybridizing, yet many attractive qualities, from its small plant size and relatively large flowers to its wonderful fragrance. It is indeed a delightful addition to our modern gallery of favorite Cattleya species- late in arriving, but worth the wait.